Thank You Message for Dad : Father is the person who makes the highest sacrifice and dedication for his children. He always takes utmost care to his children. Every dad is a superhero to his children. Father is the most important asset in everyone’s life. As the father is a special one, so treat him as special! 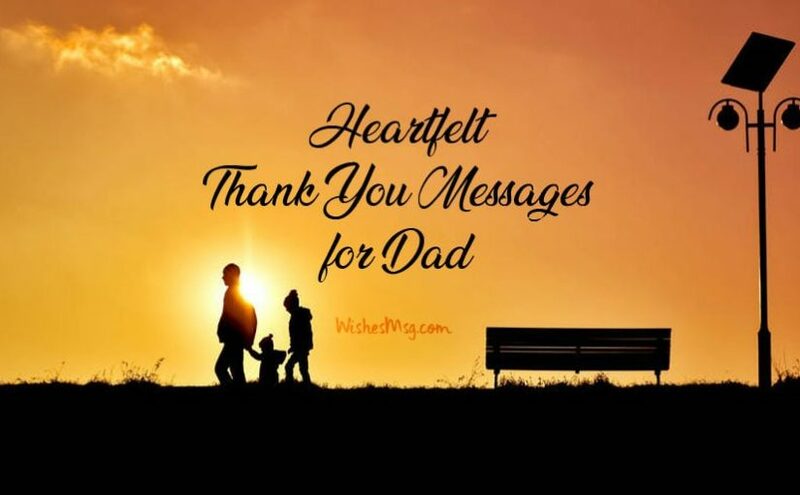 Let’s make him feel your cordial love and express that you are grateful to your Dad for his contribution in your life. Usually, we are not used to saying “Thank You Dad” to face to face. But, a cute note, letter, thank you card or a sweet text can help you to express your pride to your dad. Don’t waste a single moment, let your father realize how much you love him and thankful to him for his sacrifices. Thank your dad for making your dreams come true and make him feel proud. Here we provide some Thank You Message for Dad, choose the appropriate one and send your Dad to make him happier. You carried me in your arms when I was little. By holding my tiny hands you taught me how to stand and walk. And I learn to walk in the road of my life from you. I am grateful to you, Dad. Before being a great dad, you are a great human being. Your Honesty, Your truthfulness, your helpfulness, your nobility, all of your goodness made you a great Person. And I’m proud of you Dad. Dad, Thank you for no reason. Thank you for every reason. Actually, I don’t know how to express my love for you. I’m just speechless by remembering your contribution to my life. I love you so much. My today’s life is a gift from you. I’m so much grateful to you, grateful to Almighty God, who gifted you as my Dad. I will never be able to be a person like you. Thank you for being my Dad. Thank you for giving me life. Thank you for showing me good from bad. Maybe these thanks seem like little lame. But dad, today I have to thank you for everything. I love you. Whatever I do, wherever life takes me, I will always be thankful to you my Dad. Because I know without you my life would be worthless. The most exclusive and nonparallel thing in my life is you, my Dad. I’m thanking you for being so fantastic. And one day you will be proud of me too. I love you. Daddy, I love you from the core of my heart. And you are the only person in the whole world who deserves this love. Thank you for everything. Dear Dad, it’s a message from your Daughter, to expose the unconditional love for you. You are the best Dad in the entire world. Thank you Dad for being my king. In movies I saw Superman, Spiderman, Batman. But in reality, I saw a superhero with all the quality and power in a package. 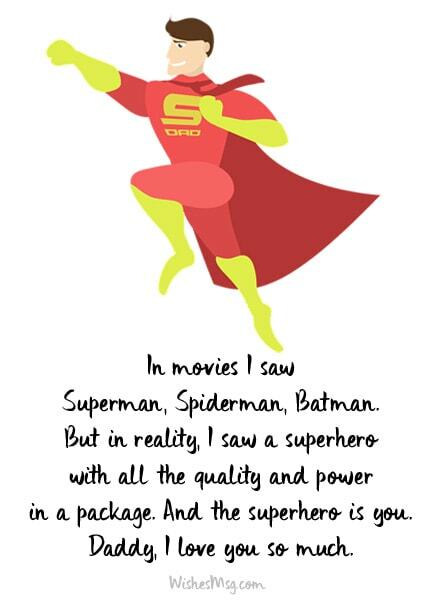 And the superhero is you. Daddy, I love you so much. My handsome Daddy, Thank you for always reach my needs and demands. You are my mind reader. You are my super daddy and I love you so much. Thanks! At the worst time of my life, You are the only person who stands by me. Always you guided me on the right path. And I will always be thankful to you my dad, for your dedication. I love you. 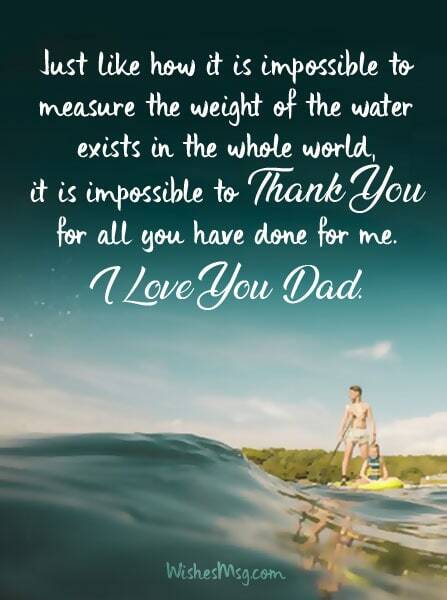 Just like how it is impossible to measure the weight of the water exists in the whole world, it is impossible to thank you for all you have done for me. I love you a lot, Dad. All of my childhood memories are so much loving and cheerful, You are the only person who made my childhood so much blessed, and still making my life beautiful. Dad, I can’t express thanks for your contribution in words. Love you dad. You are not an ordinary man to me. You are the most important person in my life. You are my best friend Daddy. Thanks for all the sacrifices. Thank you for realizing my needs on time. I love you. Dad, Thank you for stand by me every time. Thank you for teaching me all you can. Thank you for beings extraordinary. Thank you for every single Day. My sweet Dad, you taught me how to walk, you taught me how to swim, you taught me how to ride a cycle, you taught me how to stand against difficulties. Now, would you teach me how to express thanks to you? I’m so much grateful to Almighty God, who gifted me the Father like you. Your importance in my life could not be express in words. Thank you for everything. Dad, Each and every moment of my life you were with me. Every time you helped me to find the right path. I’m so grateful to you. Thank you a lot. I love you Daddy. At the moment when I feel so much disappointed with my life. Then, I just close my eyes and believe me, that moment I found you in my mind. Daddy, thanks a lot, for being with me always. I know how much you love me. From childhood to now you love me the same way. How could I express my love for you, Dad? I just wanna say I love you a lot and thank you so much for everything. You told me, “One day you will realize the dedication and feelings of your father”. Yes Dad, now I do realize your feelings and dedication for me. I’m sorry for everything I did and thank you so much for being with me. The way of life is not easy when I stay a far from you, I can realize this. I can feel the importance of you, Daddy. I could realize that I miss you. Thanks a lot for being my Super Daddy. When I was a child you held my hand every time. Now I get elder, hence you could not hold my hand, but the guidelines of yours always help me to find the right way. Dad, you are my guide. Thank you for everything. Dad, whenever I feel any trouble I just remember you. And I don’t know how you can discover that I need help! It’s a miracle to me. Dad, you are my rescuer! Thank you a lot for being so. 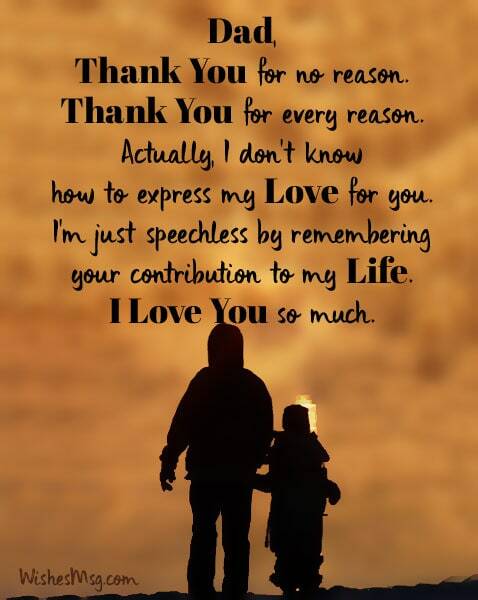 Dear Dad, I want to express thanks from the core of my heart. Just wanna say, Thank you for making my dreams come true. Thank you for shaping my life. I’m proud of you. Thanks, Dad! We rarely tell our father how we really feel for them and often failed to appreciate his sacrifices. We all need to be thankful to our Dad for being a strong support in the worst time of life, for the utmost care and unconditional love. Fathers are the heroes. So never be failed to show your gratitude and respect to your father and nurture the sweet bond of father-daughter or father-son relationship.